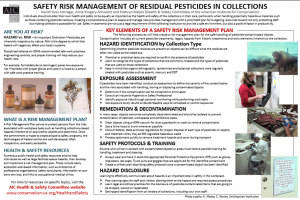 Collection-based hazards, acquired post-treatment from pesticide use, are well documented, as is their potential for adverse safety and health effects on object or specimen users. The public health control hierarchy of remediation/substitution, engineering controls, safe work practices and personal protection is fairly easily applied to the removal or minimization of toxic particulates, such as arsenicals. However, exposure control of residual organic chemicals existing as vapor at standard room temperature and pressure is both difficult and complicated. Organic chemicals penetrate and absorb into wooden storage furniture and paper-based storage supplies, and adsorb on metal, glass, and other non-absorptive materials. Some vapor-phase pesticides, such a para (1,4-) dichlorobenzene and naphthalene, re-crystallize on both collections and storage equipment, resulting in a continual vapor accumulation and equilibration within a cabinet, and a sometimes substantial initial inhalation exposure upon case opening. Absorption and adsorption by collections also results in long-term inhalation exposure for anyone handling or studying treated items. The range of persistent organic chemicals from legacy treatments is daunting. Fortunately, use of many of these chemicals has ceased in U.S. museums. However, use of naphthalene and paradichlorobenzene continues, largely because of their widespread availability in this country. Both paradichlorobenzene and naphthalene are classified as “reasonably anticipated to be a carcinogen” by the Dept. of Health and Human Services, National Toxicology Program, most current (2011) 12th Report on Carcinogens. The residues of treatment with these chemicals can include a sticky layer that adheres insect carcasses and other frass to the surfaces of storage furniture. This requires intensive post-treatment labor to remove, or possibly expense to replace storage equipment. Prevention of infestations is key to sound integrated pest management (IPM) programs. Pest inspection and where warranted, measures such as freezing, heat treatments, and anoxia are well documented as to their efficacy in pest eradication. These steps can preclude the need for extremely potent chemicals that leave lingering safety risks. As a caveat, use of heat treatments for any material known or suspected of having been treated with long-lived organic chemicals should be avoided unless adequate capture filtration for can be provided for the vapor generated during treatment. 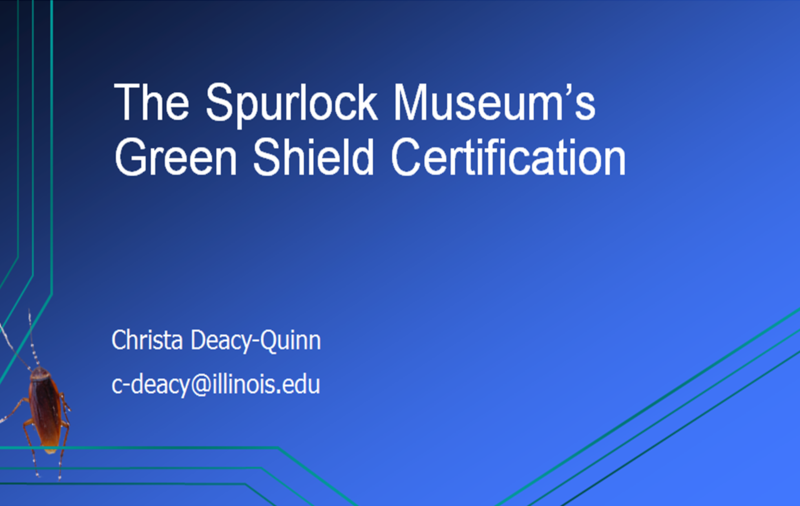 In September 2012 the Spurlock Museum became the first museum facility to be awarded Green Shield Certification through the IPM Institute of North America. The Green Shield Certified program maintains the highest certification standards in the industry to ensure recognition of those implementing advanced IPM practices to solvepest problems while protecting human health and the environment. To attain certification, participants must undergo a rigorous, expert on-site evaluation to verify that they meet the Green Shield standards. Those standards are developed in collaboration with the Green Shield Certified Technical Advisory Committee, composed of scientists, environmental experts, and pest control industry leaders. They have been refined through field testing with professionals in companies and facilities across the nation. 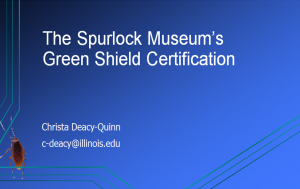 This paper focuses on the museum’s rationale for pursuing Green Shield Certificationand its experiences in preparing for the on-site evaluation. The Smithsonian’s Museum Conservation Institute (MCI) has contributed to a targeted approach to Integrated Pest Management since 1984. 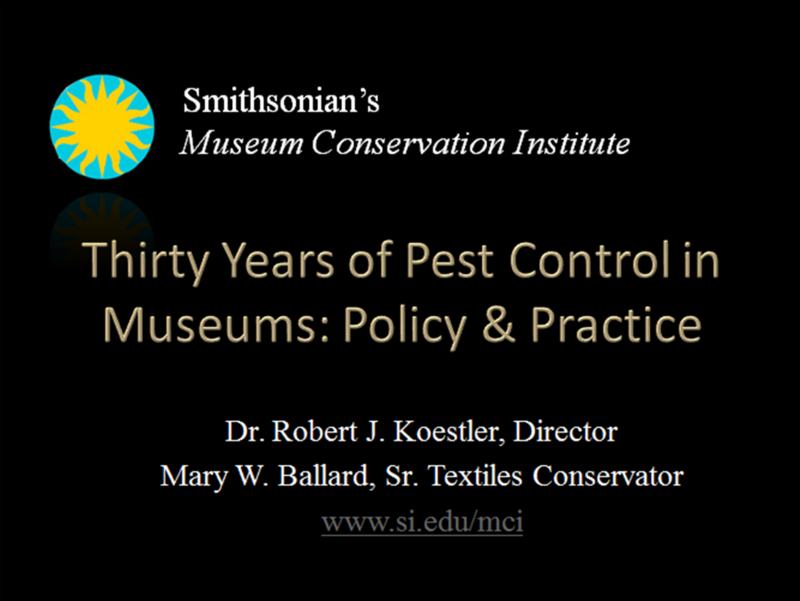 This paper will review changes in museum practices that have taken place during the last thirty years: from the closure of ethylene oxide (EtO) facilities in major libraries and museums, the introduction of museum specific approaches and courses, the advent of preventive cultural changes, the tightening of the Federal Insecticide, Fungicide and Rodenticide Act (FIFRA) and the Occupational Safety and Health Administration workplace rules, the withdrawals of numerous pesticides and moth-proofing agents, the advent of public outreach and inquiry, the development of intramural groups, the adoption of climate sensitive patterns and practice, to the formal licensing of conservators and collection management staff, and in-house museum based research on the effects of pesticides, the creation of standards for testing, and the mitigation of museum pesticides. 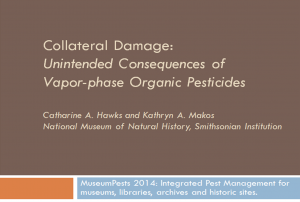 The paper will focus on the effect of FIFRA on the development of museum working standards and research initiatives as safety issues, on the gradual recognition of the need for a scientific understanding of the biology, the materials, and the regulations to control and prevent insect infestations in museums. In doing so, the distance from economic entomology and general urban entomology will be underscored. 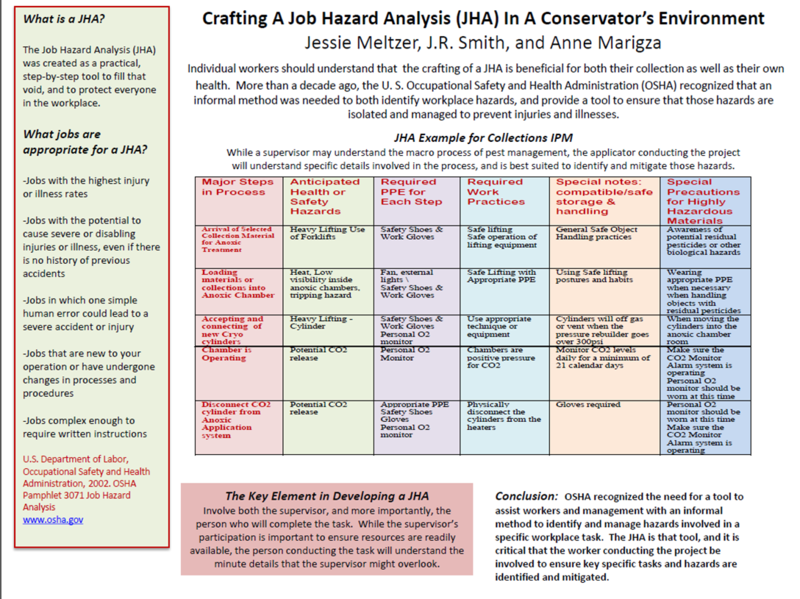 A Job Hazard Analysis (JHA) is a useful tool within a larger safety and health management system to help identify hazards by job task before an employee is exposed to the risk. A hazard is the potential for harm: an often foreseeable but unavoidable danger that, if left uncontrolled, would likely result in an injury or illness and possible deaths. 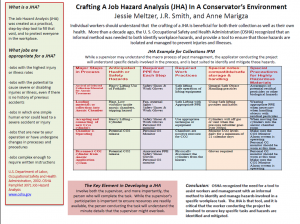 The JHA process works by focusing on the relationship between the worker, the task and the tools used during each task, and how each of those factors contributes tohazards. Once those hazards are identified, measures can be taken to either eliminating or reduce the risk to an acceptable level. Integrated pest management tasks benefitting from JHA applications include remedial pest treatment such as anoxia or pesticide applications. A job hazard analysis program in the work place empowers employees as well as will reducing injuries, illnesses, and costs. 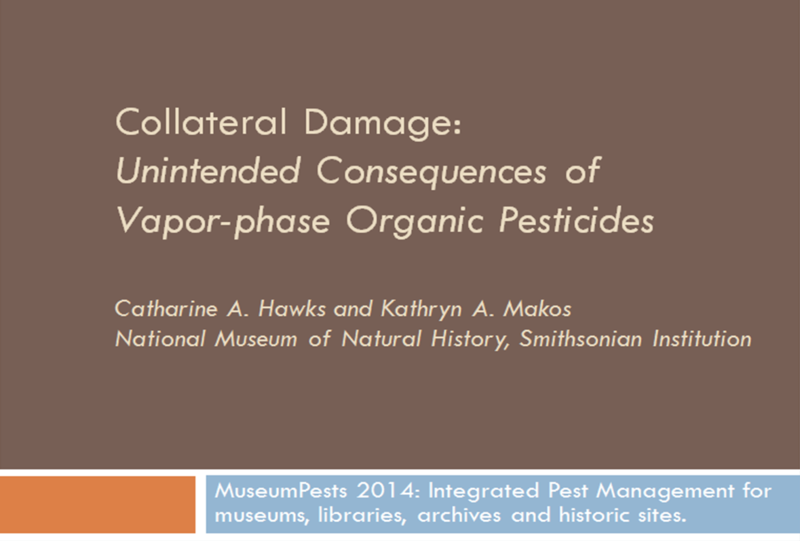 those containing pesticide residues. Creating a comprehensive plan to assess and manage risks provides management with a prioritized plan for budgeting resources toward not only protecting staff but makingcollections accessible for use. Safety investments are not just a legal requirement of the collecting institution to provide a safe environment, but also a positive factor in productivity.